Monés J, Garcia M, Biarnés M, Lakkaraju A, & Ferraro L. (2017). Drusen Ooze: A Novel Hypothesis in Geographic Atrophy. Ophthalmology Retina. To describe a subgroup of subjects with soft drusen associated with geographic atrophy (GA) and novel spectral-domain OCT (SD-OCT) findings consistent with presumed drusen leakage. We also propose a mechanism leading to GA progression in these patients. A retrospective, observational cohort study. Forty-eight eyes of 33 patients with soft drusen secondary to age-related macular degeneration (AMD). 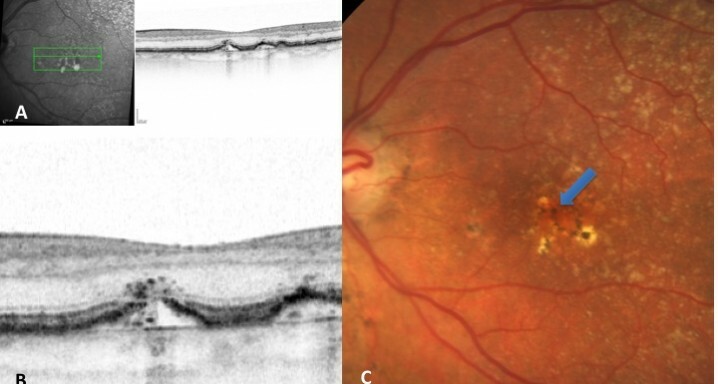 Drusen were evaluated with SD-OCT and retinal imaging to characterize the development of atrophy-associated drusen regression (drusen collapse) over a follow-up period of ≥18 months. The presence of isoreflective dots at the outer retinal layers associated with retinal pigment epithelium (RPE) defects. Percentages of previously reported hyperreflective RPE, and hyperreflective dots (HRDs) were also determined. Nineteen of 48 eyes (39.6%) showed a collapse of ≥1 druse during the follow-up period. Thirty-four foci of collapsed drusen were found to be associated with either isoreflective dots associated with RPE defects (32.4%), hyperreflectivity of the RPE (91.2%), or HRDs (79.4%). A post hoc showed the adjusted odds ratio of drusen collapse for isoreflective dots (65.8), for HRDs (6.0) or both (12.1). In soft drusen progressing to subsequent atrophy, approximately 33% were associated with isoreflective dots and RPE defects. In addition, overlying hyperreflectivity of the RPE and HRDs were noted with high frequency. Presence of isoreflective dots, with or without HRDs, was associated with a strong risk of developing atrophy compared with drusen without these findings. We hypothesize that these isoreflective dots associated with RPE defects may be debris extruded from the soft drusen into the subretinal space, which we have termed “drusen ooze”. Drusen ooze may activate the RPE apical surfaces, leading to a marked increase in phagocytosis/endocytosis of extracellular debris that eventually overwhelms the RPE capacity, and leads to RPE death, subsequent release of intracellular RPE material and thereby propagate a cycle of cellular death resulting in GA development and progression. Therapeutic targeting of drusen material, prior to its extrusion into the subretinal space and prior to irreversible damage to the RPE, might prevent or delay onset and progression of GA.